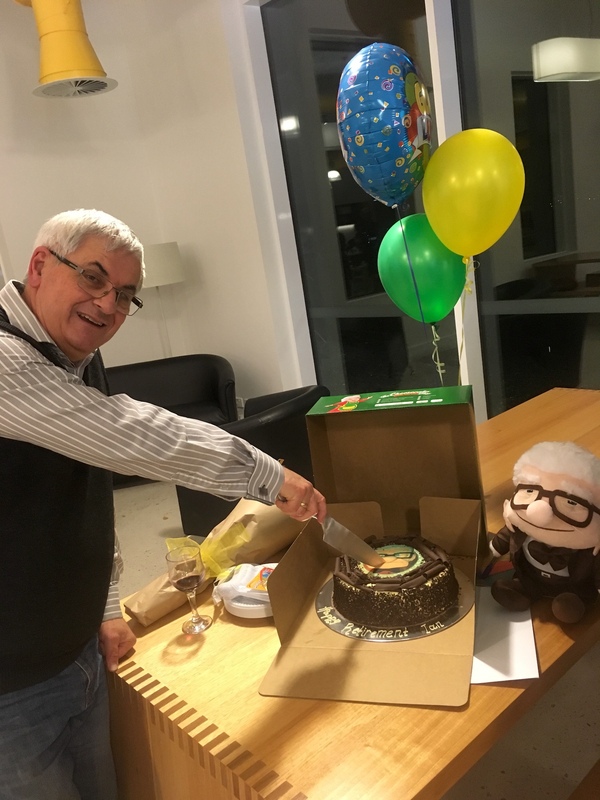 On the day before leaving, we are tying up the loose ends here in Australia – eating the last morsels of Ian’s retirement cake, chilling the French champagne that Lisette was given for her retirement and packing for the trip to Europe. Cutting the retirement cake with my mate Ian Small. So yes, we are now both officially retired! Both Ian and Lisette had colleagues asking how it felt to be stopping work, but our response never varied: “No different from any other June”. For the last three years we have left to return to Catharina Elisabeth at this time of year and each time leaving work has been the same process of handover to someone to look after our work. This year, it does not yet seem any different. So our ‘routine’ three-month lifestyle swap to cruising begins on the 2nd of July (tomorrow) when we fly out of Melbourne. Leaving behind a slightly unlooked after house – at least on the outside because of Ian’s injury preventing the final tidy up. We arrive at Veurne the next day, after about 40 hours, two planes, two trains and a hire car to be on board Catharina in the mid afternoon. We’ve had plenty of reports from friends on Catharina’s condition. All good – the only negative mentioned a couple of times is “grimy” – so out with the brush and soap once we arrive. Our big retirement lifestyle change begins on the 6th of October when we return to Australia and don’t have to go to work. Ask us then how it feels to retire. Getting away this year has been a bit fraught. One of our daughters just had an emergency admission when her pacemaker was playing up the other day – fortunately, that has seemed to settle. More worrying has been a pretty severe case of cellulitis that Ian contracted after a routine, minor surgical biopsy on his shin. This was done about three weeks before leaving and should have healed in under a week. In the end, he was admitted to hospital and was on IV antibiotics for a week just to get it under control. When he was sent home, nurses came twice a day to administer the antibiotics, replace the canula and dress the wound. We’ll save you the gory photos! Anyhow, the doctors are now cool with him travelling and he’ll be on oral antibiotics for a while longer while the wound heals and subject to the tender ministrations of Lisette who will be changing the dressings. So, last year taught us that plans (“an intention or decision about what one is going to do“) are truly made of jelly (or to paraphrase Moltke – “no plan survives contact with the enemy”) – but as we always have to catch a plane back to Australia on a pre-determined date, we do feel it prudent to have a known wintering mooring for Catharina. In consequence, we have to make some plans as to how to get there. We had originally hoped to get a winter mooring in the North East of France to set ourselves up to cruise that region next season. We tried Toul and Sillery, Châlons-en-Champagne and Conde-sur-Marne (the latter three, just south of Reims) – all to no avail. Eventually, we were delighted to secure a spot at Simon Evans’ shipyard at Migennes. So we will finish in Burgundy with the tantalising prospect of spending a couple of seasons cruising around France’s premier wine region on its most scenic waterways. 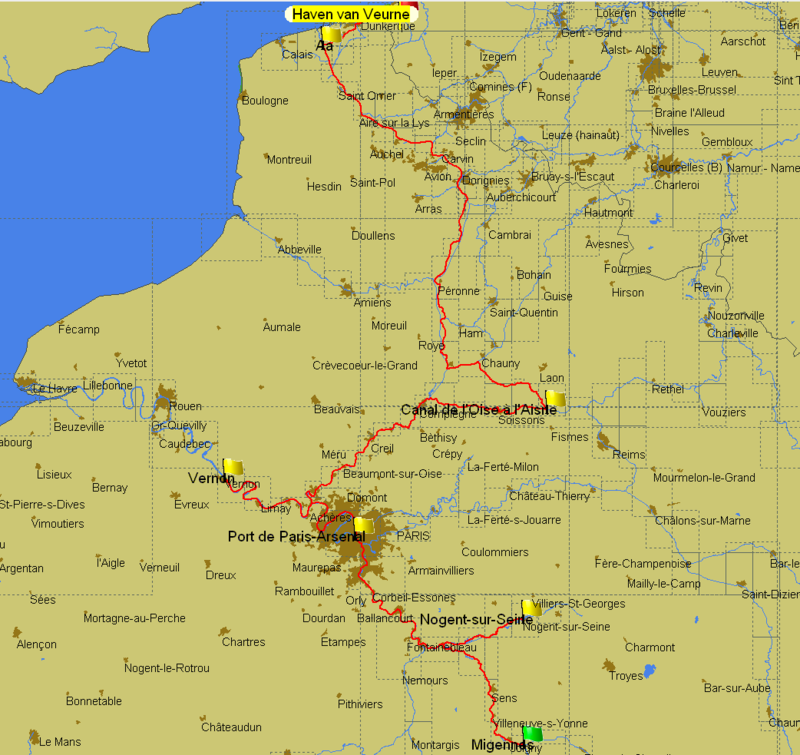 The map from our navigation program, PCNavigo. Flags are mostly to force the route we want to use. According to PC Navigo, with some conservative assumptions on cruising, this route is 981 kilometres in length and will take about 36 days cruising out of the 90 or so we have available. A fastish pace for many of our compatriots but similar to our previous years. We try to aim for about one day cruising for two days at rest. Not all of that ‘rest’ is being a tourist and some boat maintenance has to fit into those particular days. We are going to try and do some serious painting this year. In our sights is at least the decks, perhaps the hull above the waterline and whatever other touch ups we can get time to cover. We still have one hatch to strip and re-stain. To do this we plan to have some ‘maintenance’ stops on the first half of our cruise. It has, indeed, been our great fortune to start our cruising in 2014 in the Netherlands; to continue in 2015 to the Netherlands and Flanders; then in 2016 to be around Flanders and Wallonia; and 2017 exploring Flanders and around the Somme. It’s been both fascinating and sobering to have the tiniest of tiny glimpses into the horrors of The Great War even from a distance of a full century. This year, as we leave through the once war-ravaged region of Flanders and Northern France to end in quiet Burgundy, we’ll be travelling through the commemoration of the end of WWI. It’s been a truly memorable backdrop to our cruising and will be again this year as, at the very least, we want to visit the site where the Armistice was signed in the forest near Compiègne. 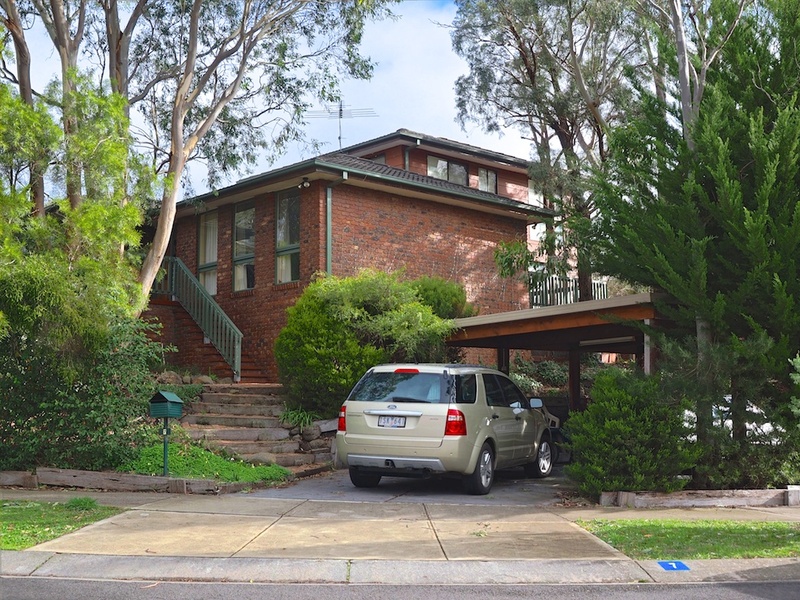 It will be something like closure to leave this sad but significant part of European and Australian history in its centennial year. To get to Migennes from our cruising direction, it is almost impossible not to go through Paris. Absolutely this has been on the ‘must do list’ and of course it would be a crime to merely cruise past the Eiffel Tower and then head out so we’ve booked a week’s mooring in the most central Parisian port – the Arsenal. It lies on the border of the 4th arrondissement right next to the Place de la Bastille. The Arsenal is a superb location for a concentrated week of exploring the glorious city. That’s slated for the 21st to 27th August. 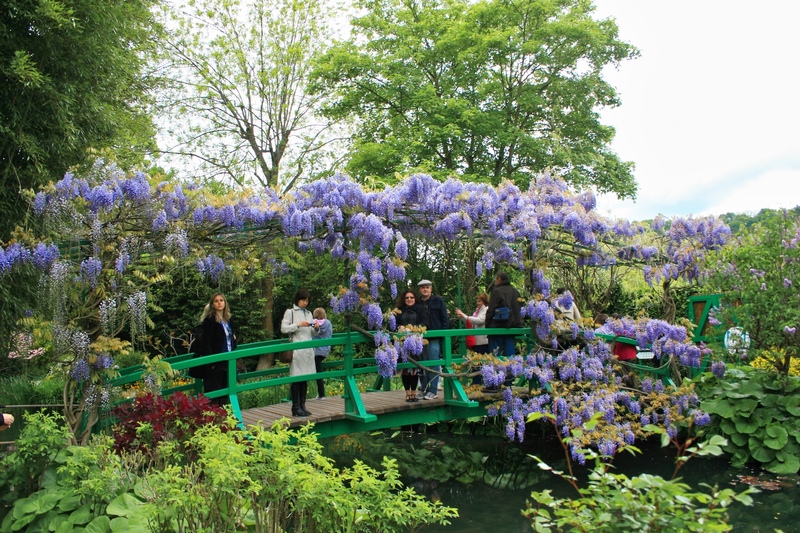 On the way there, we are determined to tick off one of our bucket list items – visiting Monet’s Garden in Giverny by barge. We visited the garden by car in 2010 and once we learned it was possible to moor in the nearby town of Vernon, on the Seine, it has been an established destination on our cruising list. On our first trip to France in 2010 for our 35th anniversary. It turns out that it has become difficult to stop at this mooring because it is heavily used by large tourist cruising vessels (also heading for the gardens) so we will probably stop just before Vernon at the lock at Mericourt and cycle to Giverny. To get to Méricourt, we decided for a number of reasons to eschew the generally favoured route down the Canal de Saint-Quentin, and instead use the less touristic route of that includes the Canal du Nord, and the Ruyaulcourt Tunnel with which we are now somewhat familiar. However, to get a bit of exposure to smaller locks, we’ve added a significant diversion by taking a turn to port just past Noyon to travel east on the Canal latéral à l’Oise to the Canal de l’Oise à l’Aisne until it joins the river l’Aisne (initially the Canal latéral à l’Aisne), heading west through Soissons to rejoin the main north-south system at Compiègne. A big detour, but it will be our main chance to get off heavy commercial waterways for the year. Heading down the Oise, another of our must-stop moorings is at the town of Auvers-sur-Oise. This is the village in which Vincent van Gough lived just before he committed suicide – or was he murdered? We’ve recently watched the superb film ‘Loving Vincent‘ that describes this part of his life. The world’s first fully painted feature film, it is composed of over 60,000 hand-drawn, oil on canvas paintings in his style. Aside from the visual splendour, the story covers aspects of Vincent’s life and relationships and draws the possible conclusion that his death was not suicide. We loved the film. So we will have another movie to re-watch before visiting a French town. We are also hoping to somehow catch up with a copy of the recently released ‘I, Claude Monet‘, to add to our cruising movie collection. Indeed, once we leave Paris, we are are also determined to visit the pretty town of Moret-sur-Loing, which was the home of the English (but French-born) impressionist painter, Albert Sisley. A contemporary of Monet, we were alerted to the opportunity by one of Wanderlust’s earlier blogs on visiting Moret. 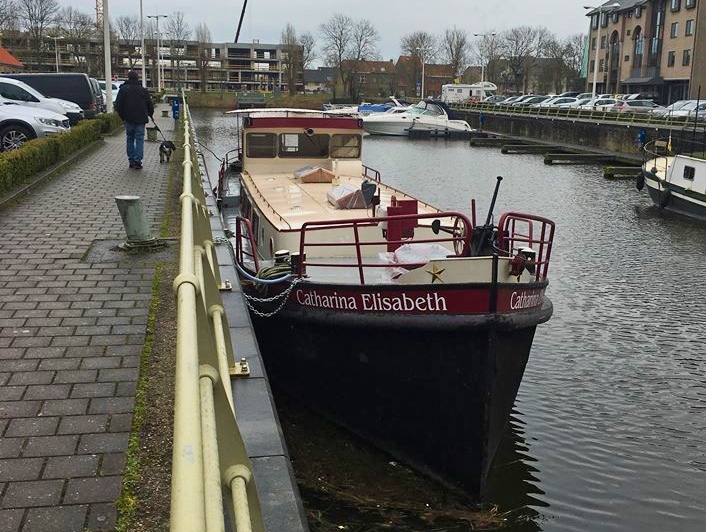 So, with significant elements of painting and painters in this season’s schedule, we have decided to name this year’s voyage “Painting Catharina“. Sorry to hear about the health issues – bad luck! Now it’s time to make 90 days cruising into 180 days. Maybe see you in Moret.